Selenium as a versatile and highly interesting element has primarily concerned chemists but, since the discovery of selenium being an essential trace element, also biologists and biochemists. This book highlights all aspects of current organoselenium chemistry and the editor, Prof. Claudio Santi, has attracted many outstanding contributions to emphasise selenium research at the borderline to biology and medicine. In addition, catalytic reactions are emphasized in many chapters demonstrating the need for sustainable chemistry while still exploiting the unique and advantageous properties of selenium. This book will be a very valuable source of information for every chemist – in education, in research, and in industry. In 1817, Jakob Berzelius discovered selenium in the sludge of the lead chambers of the sulphuric acid chamber process of a plant at Gripsholm. Because of its characteristic smelling of tellurium, (tellus = hearth), he named the new element from the Greek word “σελήυη” (Selḕnḕ) meaning goddess of the Moon. For a long time selenium was considered mainly as a toxic element, and it is currently debated if Marco Polo was the first to write about selenium poisoning. He went to China in 1271 via the ancient Silk Road and in his travelogue in 1295, he wrote that a toxic wild plant collected in the today's Gansu Province killed many cattle. In 1957 it was found to be an essential trace element as component of the 21th amino acid, selenocysteine and in 1973 the first selenoenzyme, glutathione peroxidase, was isolated. And characterized the development of the organoselenium chemistry has been strongly increased during the last fifty years and nowadays these compounds are efficiently used as intermediates and/or catalysts in a number of organic synthesis: At the same time organoselenium derivatives are currently object of wide investigations for their biological activity, especially, as antiviral, antimicrobial, anticancer, anti-inflammatory and GPx-like mimetics. 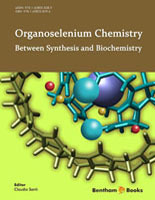 This book cover the most recent developments in the field of the classical synthetic application of organoselenium reagents such as electrophilic, nucleophilic and radical reagents focusing the discussion also on the synthesis and the synthetic applications of some emerging classes of compounds such as the hypervalent selenium species and the selenoamides. The use of organoselenium reagents as catalysts is a common thread that runs through the chapters of the book introducing new important aspects of the modern organoselenium chemistry: organocatalysis, green chemistry, bioinspiration, antioxidant activity. The book also addresses more biological issues such as the antimicrobial activity of organoselenium derivatives and the biochemistry of selenium from the aliments to the selenoproteins. I’d like to thanks and underline the precious contribute of the 27 distinguished scientists that decided to share their expertise on producing this volume that is the first multidisciplinary approach to the constantly in progress world of organoselenium compounds. I hope that this book will be read with interest not only by experts but also by students and any other researcher and chemist.